The term “natural” is most closely connected with the term “clean label”, as it is considered as a point of entry to the market for the so called clean label claims. All natural food is food that contains all natural additives such as sweeteners, food colours, and flavourings, which were not originally in the food. The key player assesses the all natural food & drink market value to be $97.5bn in 2017. All natural foods form the leading segment in the health and wellness market, and the demand for these foods is expected to remain high during the forecast period. Where is the all natural food & drink market heading? 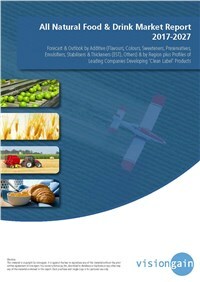 If you are involved in this food sector you must read this brand new report. This report shows you the potential revenues streams to 2027, assessing market data, trends, opportunities and business prospects. Our 156 page report provides 106 tables, charts, and graphs. Read on to discover the most lucrative areas in the industry and the future market prospects. Our new study lets you assess forecasted sales at overall world market and regional level. See financial results, interviews, trends, opportunities, and revenue predictions. Much opportunity remains in this growing all natural food & drink market. See how to exploit the opportunities. In addition to revenue forecasting to 20257 our new study provides you with recent results, growth rates, and regional market shares. Our investigation discusses what stimulates and restrains business. Understand the dynamics of the all natural food & drink industry and assess its potential future sales, discovering the critical factors likely to achieve success. Rest of RoW All Natural Food & Drink Market Forecast 2017-2027. We predict strong revenue growth through to 2027 for all natural food & drink. What issues will affect the all natural food & drink industry? A significant rise in the number of “clean label” new launches (which include organic, no-additives/no preservatives and all natural products) over the last ten years in Europe. Almost a third of all new product launches in Europe claim that they are natural, which shows that consumers are highly interested in the natural produce. North America is the largest market for “clean label” and natural food and drink. It shows a positive trend in launching healthy products (all natural, organic, no additives/no preservatives). Find analysis of technological, commercial, and economic matters, with emphasis on the competitive landscape and business outlooks.